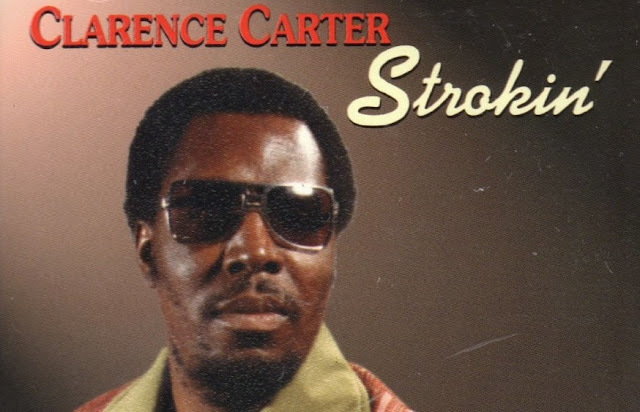 Decision: Should you play Masterstroke? For Everyone Else: If you have decided to spend most of your restricted slots on ploys (particularly My Turn, Ready for Action, Trap, and/or Pit Trap), you should consider Masterstroke as a solid replacement for one of the restricted score-immediately objectives. If you have decided to continue to play the restricted objectives, it's probably not worth adding in Masterstroke. One very positive effect of the release of the banned and restricted list on deckbuilding is the widening of what we call the "maybe-space". This is the list of cards that aren't necessarily auto-includes, but also aren't trash. The more cards that are allowed to exist in the maybe-space, the more variety players will see in deckbuilding at competitive events. 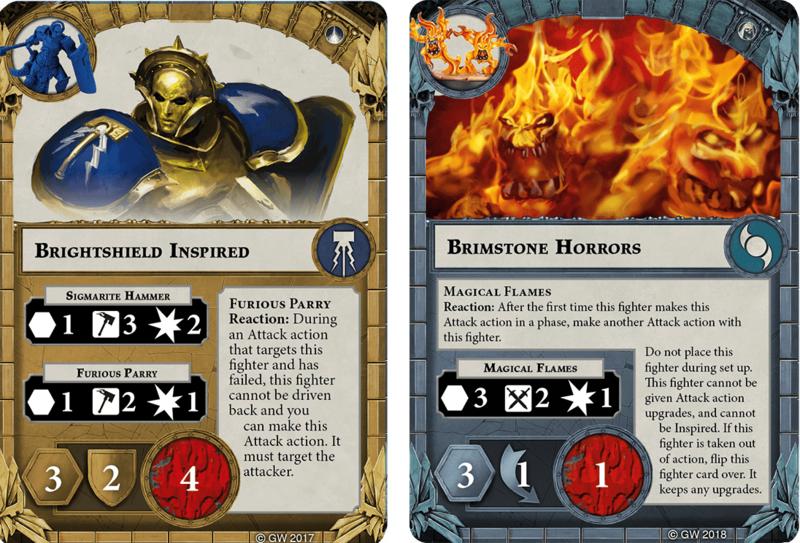 We here at Call it Shadespire recently retooled all our decks to accommodate the banned and restricted list, and we noticed an eerie similarity in the experience: no matter what kind of strategy we were playing or what warband we chose, we tended to have all 3 banned cards and 12-13 restricted cards in the deck. So, for us at least, the B&R list effectively created 10-11 cards worth of room in the maybe-space of deckbuilding. The question then becomes: how do we fill those 10-11 slots? The consensus online seems to favor using most or all of the available restricted slots on ploys and objectives. Even following this general rule, however, we are going to find the need to seek out at least a few new options for ploys and objectives to replace those lost to the B&R list. 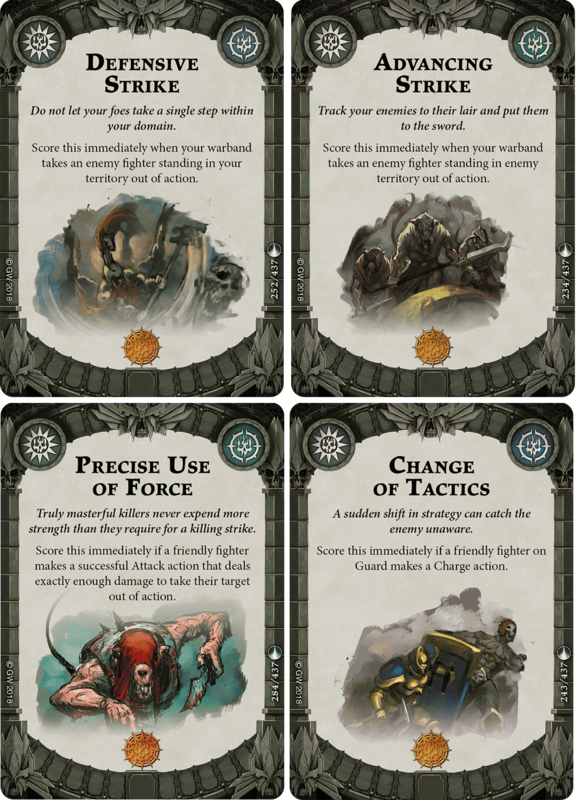 One type of card that was particularly hard hit by the list was the subset of "score-immediately" objectives that were playable across many different kinds of decks; in particular we are talking about Advancing Strike, Defensive Strike, Precise Use of Force, and Change of Tactics. This opens a lot of maybe-space for cards in a similar vein - those that are score-immediately, easy to achieve, and usable across more than one archetype. One obvious choice here, as illustrated by Jamie Giblin over at Katophrane Relic, is What Armour? We are going to be looking at another strong contender today: Masterstroke. The main factor to be considered in whether or not we should play Masterstroke is access to reactions that can satisfy its requirement. This requirement can be satisfied in many ways: through innate reactions on your models, through upgrades that provide reactions, or through ploys/spells. We will begin by looking at the method that requires the least investment - innate reactions on models. With the release of Zarbag's Gitz and Eyes of the Nine, the total number of models who have at least one innate reaction rose significantly to eleven - unfortunately for this discussion, seven of those are Gitz who's reaction can't trigger Masterstroke. 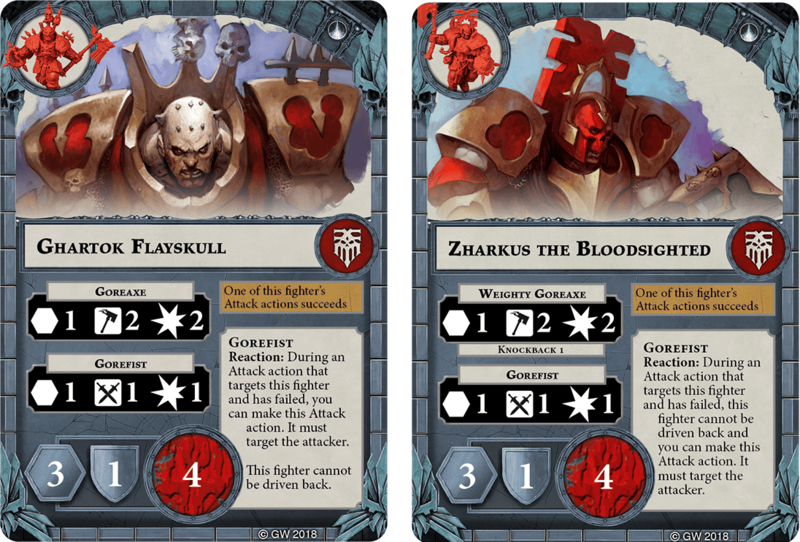 Of the remaining four models, two have viable reactions on both sides of their fighter card; both of which come from Magore's Fiends. Ghartok and Zharkus both come packing identical reaction attacks, allowing you to swing back with a 1-1-1-sword attack (1-2-1-swords inspired) whenever they are missed by an enemy attack. This ability - particularly since it is available from the beginning of the game - makes Masterstroke quite easy to achieve for Magore's players. The other two models with viable reactions require inspiration or pseudo-inspiration in order to use their reactions. Brightshield's Furious Parry actually outperforms the Gorefist reactions of the Fiends by quite a bit (56% raw accuracy on inspired Gorefist vs 75% on Parry), which helps to mitigate the fact that she has to inspire to gain access to it. 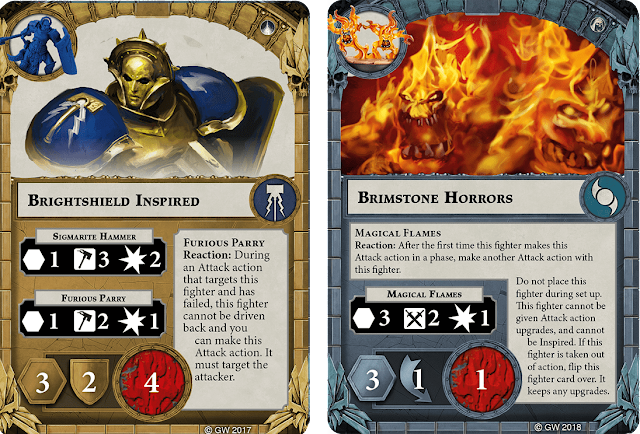 The Brimstone Horror's Magical Flames reaction falls into a very different category, as it's useable only a few times per game, but doesn't require an opponent to miss an attack to trigger it. Magical Flames equals inspired Gorefist in accuracy, but has the advantage of increased range. In the end, the availability and reuseability of Gorefist probably make Magore's the warband that can most easily take advantage of their innate reactions to score Masterstroke. Brightshield's and the Horror's reactions, while harder to gain access to, still ensure that the Champions and Eyes will have an easier time scoring Masterstroke than most other warbands. However, even without innate reactions, most warbands can fairly easily score Masterstroke with only minimal investment in ploys and upgrades. Masterstroke can be scored in a number of ways, but the one people are probably most familiar with is through the use of reactive attack actions, ie. those reactions that grant an attack when triggered by something an opponent does. These actions reactions are generally triggered by an opposing fighter's attack - most often a failed attack (though there are exceptions). As evidenced by it's inclusion on the restricted list, My Turn is likely the strongest of the universal options that provide reactive attacks. However, restricted slots are at a premium, so other options may prove more appealing. Aggressive Defense provides good utility, as discussed here. Finally, Parrying Blade provides a solid reusable counterattack with good accuracy that can be handed out to anyone. There are a number of other universal cards that provide reactive attacks, but they are less attractive due to decreased reliability. Some warband-specific cards also provide reactive attacks with which to score Masterstroke. Of those, Fueled by Slaughter (Garrek's Reavers) stands out, as it is triggered by attacks and ploys, triggers off any model dying, and allows you to make the attack off any surviving model. While many of the other warbands also have additional options to make reactive attacks, they tend to either be outshone by the universal options, or are so specific that triggering them is unreliable. Fatal Strike, for example, has good accuracy and does more damage than most other counterattacks, but can only be played on one model and only triggers when that model is removed from the battlefield by an attack - not exactly hidden gold. Where reactive attacks are those that are given when your opponent does something, proactive attack reactions are triggered by something you do. Often times, this trigger will be an unsuccessful attack, but other triggers do exist. Once again the most reliable, and likely best, option of this type comes to us from the restricted list - Ready For Action triggers off something everyone is going to do at some point and provides an extra powerful effect when combined with upgrades that improve accuracy or damage. Unfortunately, Ready for Action remains the only viable universal option of this type. Fortunately, there are a few warband-specific cards that provide proactive attacks as a reaction, and some of them are quite good. Sepulchral Guard, Cursebreakers, Chosen Axes, Thorns, and Eyes all have ploys that provide an additional attack after you make an unsuccessful attack. Guard and Farstriders can both grab an extra attack that's triggered by simply making an attack - regardless of whether it hits or misses. Orks have two solid options for proactive attacks in Kunnin' but Brutal (triggers after a move) and Leadin' by Example (triggers off Gurzag killing folks). Several other cards provide similar effects, and may be worth considering depending on which warband you play. As far as upgrades that provide proactive attacks, two warband-specific cards are worth looking at for scoring Masterstroke. Volley Caller (Gitz), discussed in detail here, is particularly good in that it can produce an extra attack literally every turn. Righteous Strike (Champions), on the other hand, is much more specific in its trigger, but thanks to current FAQ literally allows you to keep making attacks until you hit, as long as your opponent doesn't interrupt your reaction window. Unfortunately, Righteous Strike can also only be played on one model, and can only trigger off missed attacks against the enemy leader. While having it hit the table near an enemy leader will almost guarantee that you can score Masterstroke, it probably isn't worth including just for that (as opposed to Volley Caller, which provides good utility outside of scoring Masterstroke). Like the reactive attacks discussed above, reactive damage effects trigger off something your opponent does. These reactions generally deal less damage than an attack would, but do not require an attack roll to succeed. Which type is more valuable to you depends largely on the attack strength and accuracy of your warband, so choose your options wisely. In a lot of situations, reactive damage cards trigger after one of your models is taken out of action by an opponent's attack. Reavers, Guard, Eyes, Thorns, Dwarves, and Gitz all have warband-specific ploys that deal 1 damage (with varying targeting restrictions) when an enemy attack takes one of their fighters out of action. Skaven also pick up a reaction of this type as an upgrade, which allows them to use the reaction multiple times at the cost of a glory point. Finally, with the release of Nightvault, Mirror of Spite provides a universal option for this kind of reaction. One outlier also deserves mention here: Rebound. While it only has a 33% chance of firing successfully, when it does it produces one of the most powerful swings in the game, effectively making your opponent use their activation to hurt their own model. It's also the only reactive damage card that has the potential to deal more than 1 damage to a single target. While certainly not an auto-include, if you are running Rebound, you should definitely be considering Masterstroke strongly. Finally, we come to what is probably the most overlooked way of scoring Masterstroke: proactive damage reactions - those that trigger off something you did. To begin with, we should give the (restricted) elephants in the room their due by recognizing that both Trap and Pit Trap can score Masterstroke, and have an extremely common trigger to react to. In terms of universal cards, there are also two other options for proactive damage reactions. Spiked Surface can score Masterstroke, but its trigger is so specific that you'll likely never play it. Dirty Fighting, on the other hand, is probably going to trigger fairly often (though it will only deal damage half the time). If you're planning on stacking up a Fjul-Grimnir, Skritch, or Gurzag with a ton of upgrades and activating them multiple times a round, Dirty Fighting may be worth inclusion as another method to score Masterstroke. There are also two warband-specific reactions that deal proactive damage, and both are worthy of consideration. Lightning Whip (Cursebreakers) triggers off a successful attack, like Trap, and should be considered strongly for any Cursebreaker deck - doubly so if you are trying to score Masterstroke. Creeping Terror (Thorns) enables Masterstroke, as well as some other warband-specific objectives. Finding a comparable objective to Masterstroke has proven somewhat difficult. Very few objectives deal with reactions; there are warband-specific options that are patently better (Treacherous Foe from Thorns) and universals that are worse in every way (Sorcerous Retort). Instead, we sought to find alternatives that A) were not restricted, B) scored 1 glory, and C) required an enemy model to be taken out of action by a specific type of attack. The Bigger They Are and Finish Them are effectively identical and serve as a good point of comparison for Masterstroke. While there are certainly vastly more base attacks with 1 damage than there are base counterattacks (57 vs only 4! ), there are far fewer ploy/upgrade options that will trigger either of these objectives. Additionally, we should consider economy of action; using something that triggers Masterstroke will (by definition) always be in addition to your four activations, but triggering Finish/Bigger will likely require you to use an activation on a sub-par attack. It's also worth noting that Finish/Bigger can only be triggered by attacks, meaning restricted powerhouses like Pit Trap and Trap cannot ever be used to score them. Finally, it should be noted that upgrading or inspiring your fighters may make scoring either of these objectives impossible (as is the case with inspired Orks). 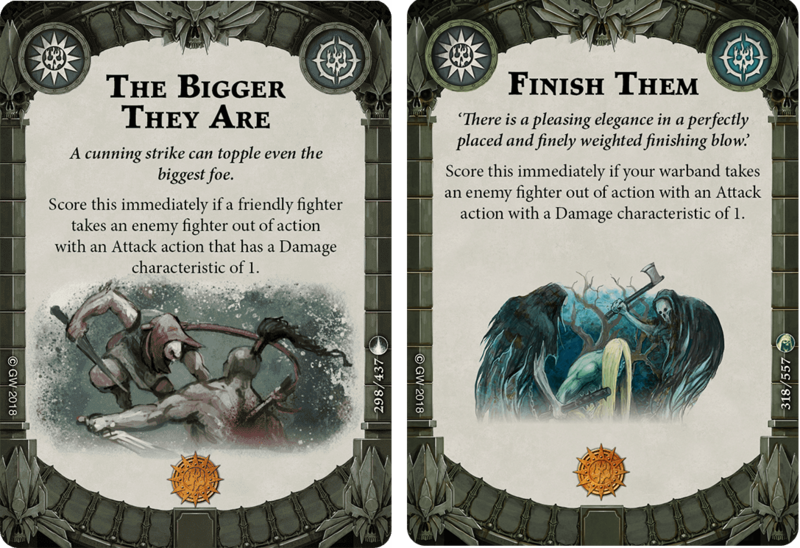 In the end, Bigger/Finish provide some utility for warbands that have a lot of low-damage attacks, especially those that have a decent range (Farstriders/Gitz/Eyes), but Masterstroke provides a more efficient option to decks that already pack powerful ploys and models. 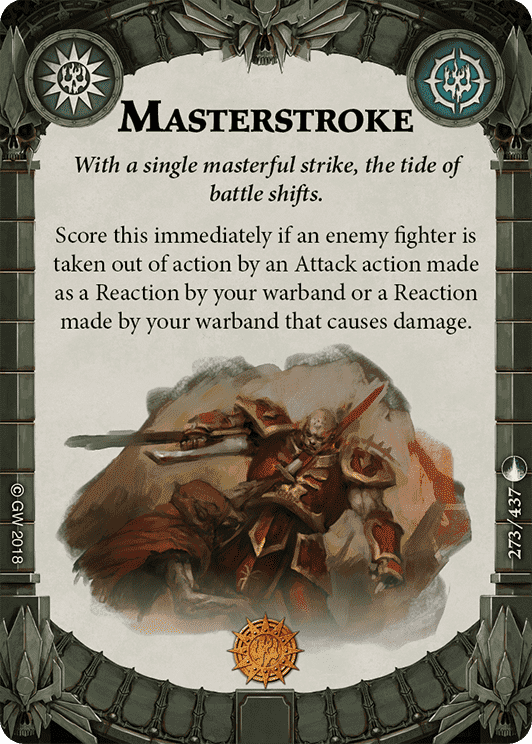 Masterstroke provides a good option to replace existing score-immediately objectives that have landed on the restricted list. From certain warbands, it's almost trivial to score, thanks to innate reactions that provide attacks. Other warbands will have to include ploys and/or upgrades in order to score Masterstroke, but many of these were already considered auto-includes before the release of the B&R list. Ready for Action, My Turn, Trap, and Pit Trap remain powerful options for those who wish to spend restricted slots on ploys, and all synergize effortlessly with Masterstroke. Additionally, many cards that entered the "maybe-space" after the release of the B&R list also work well to trigger Masterstroke. These up-and-coming options - like Aggressive Defense and Parrying Blade - will likely begin to see as much play as many of the auto-include options of the past. Finally, several warbands have options to trigger Masterstroke without relying on attack rolls, which is always an option worth exploring.